Faith in marijuana stocks is starting to dissipate at the start of the week after a number of headwinds from last week have continued to leach into investors’ minds and force them to question the longer-term strength of the marijuana space more broadly. The two pot stocks we’re watching this week are Aphria (NYSE:APHA) and Tilray (NASDAQ:TLRY). Last week, one of Cowen & Co.’s top marijuana market analysts, Vivien Azer, cited potential headwinds that could bear down on cannabis producers. And yesterday morning, a major earnings disaster in a popular pot stock echoed the analysts’ concerns as well as a preexisting narrative that sales of marijuana might slow considerably in the months ahead. Specifically, Azer cited oversupply and quality control issues as reasons for “lowering her first-half expectations for a handful of Canadian growers.” In some cases, the lower quality cannabis might be “un-sellable.” The ETFMG Alternative Harvest ETF (NYSEARCA:MJ), which tracks key marijuana growers, dropped more than 5% over the past five days as a result of the negative outlook. And Aphria — yesterday morning’s big-time earnings flop — dropped nearly 15% on Monday, April 15. After considering this lackluster product and the possibility of fewer sales, the short-term case for some marijuana stocks has certainly become a bit murkier. But is it all doom and gloom in the marijuana space? The following are two of the key cannabis stocks to watch this week: Aphria and Tilray. But perhaps more damaging for the stock wasn’t its failure to satisfy Wall Street estimates, as InvestorPlace contributor Vince Martin points out in his earnings breakdown, only a few analysts are currently setting the tone for APHA stock. Adding to the sizable dip in APHA stock is the fact that a potential buyout by Green Growth Brands (OTCMKTS:GGBXF) is no longer on the books, causing some investors to question whether the company can hold its own against the competition or if the company might not see another offer any time soon. TLRY stock joined Aphria in the dive yesterday, dropping more than 7%. In-line with Azer’s assessment of the marijuana space last week, TLRY stock has come under scrutiny lately for potential oversupply issues in Canada, which might affect the company’s longer-term growth narrative. The hype around the pot business is expected to lose some of its vigor as supply and demand for marijuana begin to balance out. Despite the negative short-term outcast, analysts still collectively expect an upside of more than 87% for TLRY stock over the next 12 months (an average price target of $107). Whether this is a realistic number for TLRY to reach may become clearer when the company next reports earnings on Jun. 17. Wall Street still expects an earnings-per-share loss of 29 cents on revenues of $24.85 million for the report. But we might expect the story behind Tilray (and analysts expectations) to change in light of Aphira’s earnings-based pain yesterday. As of this writing, Robert Waldo did not hold a position in any of the aforementioned securities. 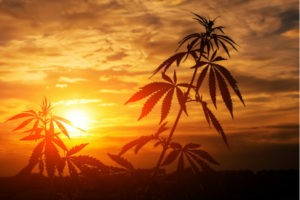 Article printed from InvestorPlace Media, https://investorplace.com/2019/04/top-marijuana-stocks-to-watch/.